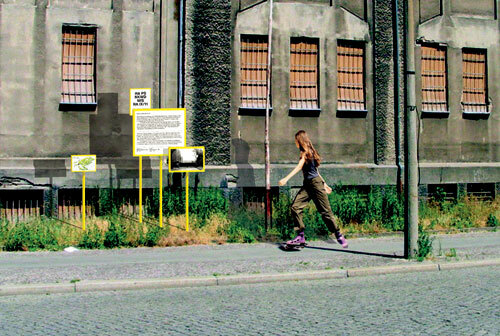 This design concept for the area in and around the ex secret police detention centre in East-Berlin tries to reveal a grammar of administrative power, generic and current as well as specific and historic, in order to address the question of commemoration and processing of the heritage of Germany's political past. Lists of acronyms of names of facilities, organizations, processes, posts or organizations are used as historical footnotes when they are placed in the urban landscape. Furthermore, detailed information about the use of buildings are displayed in a sub-categorized design, split into a cluster of standard signs which evoke the visual messages of order and authority.